Posted in: Art, Music, Photography. Tagged: Barbizon, French, Narcisse Virgile Diaz de la Peña, Nelson-Atkins Museum of Art, Oil on wood panel, The Approaching Storm. 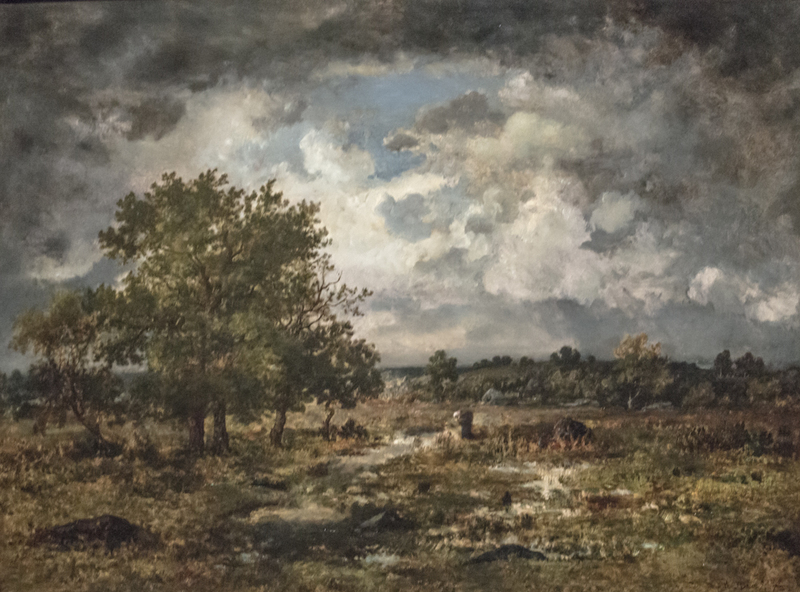 "As a storm begins to darken the sky, Narcisse Virgile Diaz de la Peña’s variegated, unrefined brushstrokes emphasize the rapidly changing light and atmosphere beyond a group of native oak trees. The locale, the Forest of Fontainebleau, was controversial because of its extensive plantings of Russian pine trees. The Barbizon artists strongly opposed this, viewing it as the destruction of the ancient Gallic character of the land." I heard the same thing from the Native American people who consider the Russian Pine tree on their land as an encroachment and destruction of their lands. Reminds me of the Hudson River painters. Just curious – Spanish name, French attribution. Part of the Barbizon school? I believe so, his parents were Spanish.